SoftPlanet makes it possible for everyone to get free Trend Micro Titanium Antivirus+ download directly from our servers. There is no registration needed for downloading. As everyone knows the Internet is not the safest place to store data and share information. Trend Micro offers great protection for your PC and mobile device. It is called Trend Micro Titanium Antivirus+ 2014 7.0.1151. The security suite protects against viruses, blocks dangerous websites and prevents identity theft. Trend Micro Titanium Antivirus+ 2014 7.0.1151 is another antivirus application, which promises to detect dangerous content or viruses and keep your PC safe against phishing attempts or spyware. It also assures you real-time cloud-based protection. It notifies you when you are about to access links, which are considered as dangerous no matter where they are placed – in your mailbox, web browser or instant messaging client like Skype. Trend Micro Titanium Antivirus+ 2014 7.0.1151 can perform on-demand scans – Quick, Full and Custom scans. It can be set to remove the files that can automatically threaten your security. 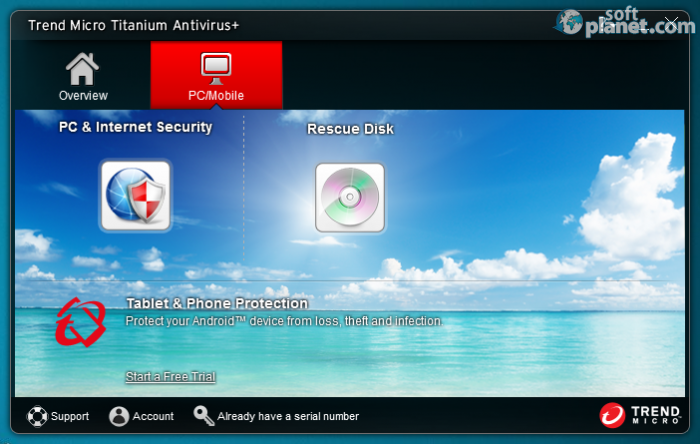 Trend Micro Titanium Antivirus+ 2014 7.0.1151 has a semi-transparent interface. You are able to change its background and put another from the list or your own image. Animations, transitions and all effects run very smoothly. The main window cannot be resized, but it is default scale is very appropriate no matter the size of your screen. Unfortunately, this is one of the small number of changes you are able to apply to its interface. Trend Micro Titanium Antivirus+ 2014 7.0.1151 can scan for malicious software when opening/saving/downloading files and detect whether any unauthorized system settings modifications are performed by a particular program. Thanks to its great interface, you are able to run a scan with a single mouse click. Once the process has finished you can review a report with one click as well. The application is not the most lightweight among its rivals, but it is not the heaviest too. 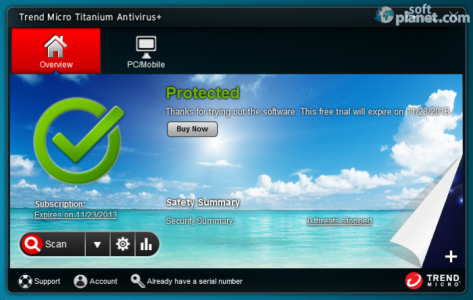 Trend Micro Titanium Antivirus+ 2014 7.0.1151 might not be the ultimate antivirus solution for a business PC, but it is a proper one for your home computer. However it comes with a 31-day trial period. In my opinion, it is best to choose Trend Micro Titanium Internet Security 2014 7.0.1151, because it is more capable of protecting your system against any kind of threats. Trend Micro Titanium Antivirus+ is VIRUS-FREE! 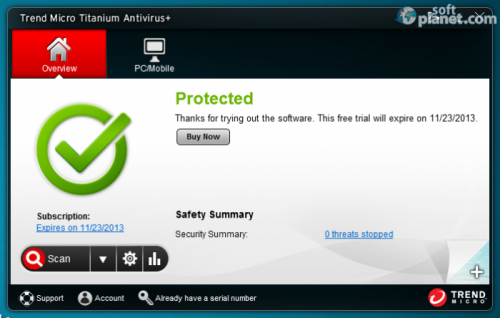 Our security scan shows that Trend Micro Titanium Antivirus+ is clean from viruses. The current version of Trend Micro Titanium Antivirus+ has been scanned by our system, which contains 46 different anti-virus algorithms. That ensures that Trend Micro Titanium Antivirus+ 2014 7.0.1151 is 100% safe for your computer.